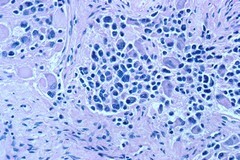 A microscopic view of ganglioneuroblastoma, which is a growth on ganglia in the nervous system. Magnified X25. (S91-2171).